Piclopedia is an open-source web-based project to translate simple-to-build plans for helpful tools and devices into plans that can be understood by developing-world farmers and artisans irrespective of the language they speak. And giving them an opportunity to share their knowledge just as farmers did during the 19th Century. The devices will be designed to be made of locally available materials, and the plans will use international design language (like IKEA instructions) to eliminate language barriers to their understanding. People with Internet access will be able to search this site for devices or methods that can help them on the farm, download and print the designs, build them, and if they wish provide feedback that may help other users. In areas where people have limited Internet access, activists may print out popular designs, laminate them, and provide them to village schoolteachers and others to lend out. In the beginning most of the plans in Piclopedia will be revisions of plans already in circulation and whose value has been established, such as those that inspired this project, those shared by farmers in the US and Australia around the beginning of the 20th Century, and reprinted in books such as Handy Farm Devices and How to Make Them by Rolfe Cobleigh (Lyons Press, Classic Reprint Series). Much newer work exists, however, such as the designs created by Open Source Ecology (www.opensourceecology.org). As time goes on, however, anything that team contributors wish to convert to plans and load onto the site (providing it doesn't infringe copyright/patent laws) can be made available. After all, why shouldn't poor people around the world have language-barrier-free access to the fruits of the world's inventors and creators just like the rest of us?! And 2-D designs are not all that we will be able to make available. If someone wants to make, say, an instructional video, it can be uploaded to YouTube and embedded in Piclopedia next to the plans it explains. Eventually we can even create ways for knowledge to be shared in multi-lingual and pictorial ways - in areas that farmers themselves consider important, such as planting, irrigating, animal husbandry, etc. We are looking for people to participate in this project. Piclopedia needs designers, drafters, artists, programmers, people with developing-country experience and contacts, grantwriters, and more! This will be a worldwide project for anyone who wants to help make the fruits of human inventiveness available to everyone else. Please join the team! 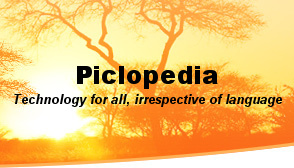 The team effort is being organized at www.piclopedia.ning.com for now. When we have enough team members assembled, including web site programmers, we will build this site into a working collaboration/publishing site similar to www.openoffice.org.